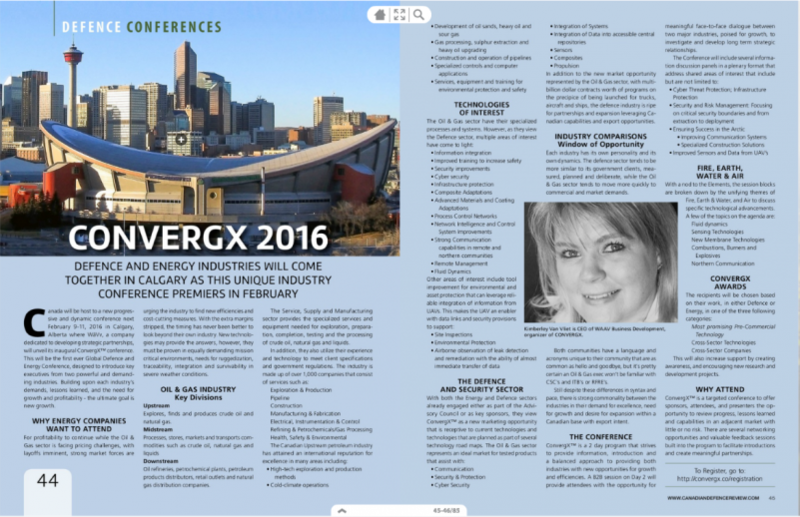 Canada will be host to a new progressive and dynamic conference next February 9-11, 2016 in Calgary, Alberta where WāVv, a company dedicated to developing strategic partnerships, will unveil its inaugural ConvergX™ conference. This will be the first ever Global Defence and Energy Conference, designed to introduce key executives from two powerful and demanding industries. Building upon each industry’s demands, lessons learned, and the need for growth and profitability – the ultimate goal is new growth. For profitability to continue while the Oil & Gas sector is facing pricing challenges, with layoffs imminent, strong market forces are urging the industry to find new efficiencies and cost-cutting measures. With the extra margins stripped, the timing has never been better to look beyond their own industry. New technologies may provide the answers, however, they must be proven in equally demanding mission critical environments, needs for ruggedization, traceability, integration and survivability in severe weather conditions. Explores, finds and produces crude oil and natural gas. Oil refineries, petrochemical plants, petroleum products distributors, retail outlets and natural gas distribution companies. The Service, Supply and Manufacturing sector provides the specialized services and equipment needed for exploration, preparation, completion, testing and the processing of crude oil, natural gas and liquids. In addition to the new market opportunity represented by the Oil & Gas sector, with multi-billion dollar contracts worth of programs on the precipice of being launched for trucks, aircraft and ships, the defence industry is ripe for partnerships and expansion leveraging Canadian capabilities and export opportunities. Each industry has its own personality and its own dynamics. The defence sector tends to be more similar to its government clients, measured, planned and deliberate, while the Oil & Gas sector tends to move more quickly to commercial and market demands. Both communities have a language and acronyms unique to their community that are as common as hello and goodbye, but it’s pretty certain an Oil & Gas exec won’t be familiar with CSC’s and ITB’s or RFRE’s. Still despite these differences in syntax and pace, there is strong commonality between the industries in their demand for excellence, need for growth and desire for expansion within a Canadian base with export intent. ConvergX™ is a 2 day program that strives to provide information, introduction and a balanced approach to providing both industries with new opportunities for growth and efficiencies. A B2B session on Day 2 will provide attendees with the opportunity for meaningful face-to-face dialogue between two major industries, poised for growth, to investigate and develop long term strategic relationships. This will also increase support by creating awareness, and encourage new research and development projects. ConvergX™ is a targeted conference to offer sponsors, attendees, and presenters the opportunity to review progress, lessons learned and capabilities in an adjacent market with little or no risk. There are several networking opportunities and valuable feedback sessions built into the program to facilitate introductions and create meaningful partnerships.